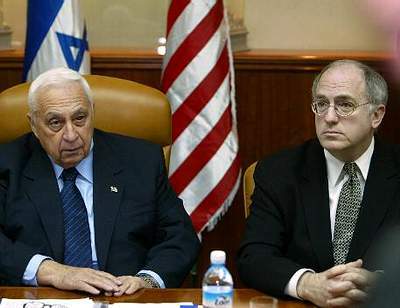 Israeli Prime Minister Ariel Sharon and U. S. Ambassador Daniel C. Kurtzer eulogizing Israeli astronaut Ilan Ramon (AP, Feb. 2, 2003). Former United States Ambassador to Israel Daniel C. Kurtzer holds the S. David Abraham Visiting Professor in Middle East Policy Studies at the Woodrow Wilson School of Public and International Affairs at Princeton University. During his 29 years in public service, Ambassador Kurtzer has held a number of senior diplomatic and policy positions including U.S. Ambassador to Israel from 2001 to 2005, and U.S. Ambassador to Egypt under Presidents Clinton and George W. Bush. In addition, he served as a lead intelligence officer in the State Department. He received a bachelor’s degree from Yeshiva University and a Ph.D. from Columbia University. Ambassador Kurtzer was recently appointed commissioner of the Israel Baseball League and he is currently serving as a policy advisor to Senator Barack Obama’s presidential campaign. Ambassador Kurtzer spoke recently to the Philadelphia Jewish Community as a representative of the Obama campaign. I want to share with you a little bit of an odyssey. It’s a personal odyssey from one who spent nearly 30 years as a professional diplomat in the service of our country, a job that required, both by law and by decision, that we be nonpartisan, that we carry out the national security and foreign policy of our country no matter who the president was, and to try to represent the American people no matter who they chose to be president. And how, in the past months, I have come to believe that it is imperative for our country to elect Barack Obama. Not just a matter of choice, but imperative. There are a lot of things you learn along the way, and I know each of you in your own personal lives and professions know that life is a constant learning experience. You not only do the job you’ve been asked to do and raise the family that you raise with love, but you draw from them the kinds of life experiences and experiences that tell you something about how to move forward. I want to share just one or two of those experiences with you to suggest a context in which my own political choice has been made. Among the privileges, and I really count them as privileges, of serving our country for these three decades in a variety of foreign policy positions in Washington and abroad, perhaps the capstone was, of course, the four years I served as U.S. Ambassador to Israel. I arrived in Israel during the most challenging time in the state’s history after it’s founding -- right after the suicide bombings started in 2001. And I found myself, for the next three years, working very closely with Prime Minister Sharon and his closest advisors on ways that not only talked about defending Israel, but had meaning on a day-to-day and hour-to-hour basis. There was probably not one day during that period, or one night during that period, when something didn’t happen and in most cases required the 3 a.m. phone call that woke many of us up to deal with very pressing policy and security challenges. So, this job was serious. It was serious business. It wasn’t the cocktail circuit or the striped suits diplomats that one reads about. And I know that diplomacy – which is the second oldest profession – has had its fair share of jokes told about it. A diplomat is one who remembers his mother’s birthday, but not how old she is. Or a diplomat is one sent abroad to lie for his country. Well, we do have memory and we don’t lie. But it’s also a job that has not just the professional responsibilities of dealing with security, but you deal with people. The number of funerals I attended of Americans killed in the intifada – we lost more than 45 American citizens including three of my security officers at the embassy killed by Palestinian terrorists in Gaza in October 2002. And the kind of face-to-face encounters with Israelis who didn’t define security as the words in a peace treaty, or the words that are mouthed by politicians and diplomats, but they defined security as whether or not they could trust the busses to take their children to school, or whether they could enjoy a night out at a movie theater or go shopping at the mall. So, when I left government service and my children, now grown, said to me that it was time that I started making decisions on the future of America. I had, as backdrop to this, not just the professional experience of working for the American government and for you, the American people, but these kinds of human experiences in which the definition of security was far deeper than the words that a person says. So, when I looked at the candidates [for President of the United States], the first question on my mind – and it is probably the first question on the minds of many of you in this room – is where does the candidate stand with respect to Israel? Now, we can all read what the candidates say, and in fact, Sen. Obama, during the course of this campaign, has said more about his views on Israel than the other two candidates. Perhaps you haven’t heard them and perhaps that is a function of a communication system that needs some improvement, but Sen. Obama has not been shy about articulating his views and he has not been shy on this issue as he has not been shy on other issues as well. He is a man who is telling us what is on his mind, what he stands for, how he intends to bring our country together and fix problems which are so critical to all of us – ranging from jobs and energy policy and health care and education – as well as problems in the Middle East and elsewhere internationally. And so we know a great deal about Sen. Obama. And we know not only from those words, as I mentioned to a group of rabbis and community leaders just a few moments ago, we also try to get inside the heart, inside the psychology of the person to whom we may want to give our vote. And we know from Sen. Obama that he is a man who means what he says. And so he doesn’t mouth the words of support for Israel. Or, as he told an audience in Iowa, which had maybe three Jewish citizens there among 300 – maybe three – when he told that audience that Israel must, in the context of any kind of a negotiated outcome, remain a Jewish state, and then went on to say that that means that Palestinian refugees must find an answer to their status not in the state of Israel, but in the state of Palestine that would emerge from a negotiated agreement. This is a man who is telling us exactly what is on his mind, and by what he will be guided when he is elected President of the United States. Now, we’ve seen in this country, specious, dangerous, venomous arguments couched in academic terms, couched in public policy terms, that seek to undermine the support of Americans for the state of Israel. I’m now something of an academic. I don’t think my academic colleagues quite see me that way, but I go to work with them everyday. And I see two professors, Stephen Walt and John Mearsheimer, under the guise of an academic exercise, write such nonsense about the policy process in this country, about the pro-Israel community in this country, and about politics, it really just blows the mind. It’s amazing. And yet, it’s against that backdrop that we are blessed with three candidates in whom we can trust with respect to their support for the state of Israel. And Barack Obama is among those candidates. So the first issue on my mind was an issue that is not quantifiable, its not measureable. You can measure the words, the number of speeches, and he’s doing OK in that, but he also means it. It is part of the make-up of this man, and its what he will bring in his character as President of the United States. Now, I was also a professional diplomat and I worked for almost all of my 30 years in and around the Middle East and so it was important to me to see how the candidates would relate to two or three of the most pressing problems on our national security agenda. 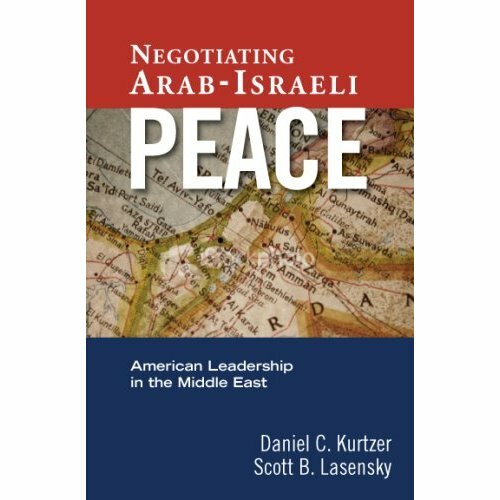 Negotiating Arab-Israeli Peace: American Leadership in the Middle East by Daniel C. Kutzer, Scott B. Lasensky and William B. Quandt. .
No matter who shows up next January in the White House, on that person’s desk is going to be the Iraq file and the Iran file, as well as health and education and jobs and energy, you name it. Because we have had eight years of disaster with respect to our foreign policy, and I have to share with you as an analyst, we have had eight years that have comprised the security of the state of Israel. An administration that has ignored the search for peace in the Middle East to a point where you have chaos in the Palestinian Authority, and you have a sham process called the Annapolis process, in which our Secretary of State, whom I admire personally, travels to region and announces when she gets there that she is bringing no new ideas. You have an administration that hasn’t engaged in the peace process, and so inherited a bad situation in 2001 and is leaving it in a worse situation in 2008. And you have an administration that has gotten us engaged in a war in Iraq that has not only cost American lives – where more than 4,000 of our men and women have been killed and tens of thousands are coming back wounded both physically and psychologically – but it’s now being called the $3 trillion war. The cost to our economy, to our future, is incalculable. And I would share with you that the cost to the security of Israel is incalculable. I was in Israel when this was being contemplated and when it started. And, as part of my job as American ambassador, I pulled together, on numerous occasions, Israeli officials and academic experts on Iraq and on the Middle East, to try to understand what we all knew was intended. There was no secret about his administration’s desire to go to war with Iraq, so I wasn’t giving away a secret by asking the question of our Israeli friends. Now, you’ve heard the nonsense which is out there which suggests that Israel or the Jewish community or the Israel lobby pushed this war on the administration. And I can tell you it is nonsense, because there was not one Israeli official and not one Israeli academic who suggested that this war was going to end well. They all warned against exactly the problems we have experienced since this war started, because Israel experienced many of those same problems. The unknowns of occupation, the likelihood that occupation is going to yield resistance, you can call it insurgency, you can call it civil war – whatever the euphemism is – it is resistance to occupation, which takes on its own dynamic and becomes a self-justifying and self-perpetuating reason for being there in the first place. And so Israel understood far better than the wise neocons who brought us this war, that this was going to be dangerous not only for the United States but also for Israeli security. And if you doubt those words, look at the nearly one million Iraqi refugees in Jordan and take a measure of Jordanian stability. Jordan, which is a bedrock of Israel’s security on its eastern frontier. So, we have now had years of presidents who have talked the talk of support for Israel, but have left in the wake of their administrations an Israel which is less secure. And therefore, the second issue that I looked at was which President was likely to leave Israel in better shape as the result of his or her policies? We have one candidate who is prepared to do diplomacy. Only one candidate. We have two candidates who have told us all the countries they don’t want to talk to. They don’t want to talk to Iran because Iran has a really awful government. And Iran does have a really awful government. And Iran is pursuing policies that are not on inimical to our interests but they are dangerous to the world – the pursuit of nuclear weapons, the support for terrorism, the idea of Holocaust denial and a president who openly says he wants to see the destruction of the state of Israel, another member state of the United Nations. So in an effort to talk to Iran, there is no excusing or negotiating away any of our fundamental interests with regard to these issues. But if you don’t talk to your enemies, who else can you talk to? When I studied Diplomacy 101, you look at the range of issues available to the United States in what’s called the diplomat’s toolbox, the most important in some respects is what is articulated by a President as his or her national security policy. That’s the rhetoric of diplomacy. And we’re pretty good at it. We issue threats every day. We tell people exactly what we don’t like about them every day. That’s OK, that’s part of diplomacy. There’s a second aspect, which is sanctions, a proactive measure against countries with which we have differences of view. And we do a pretty good job on sanctions, also. We sanctioned Iraq for many years; we are sanctioning Iran right now. And they tell you the end of the diplomatic process is the resort to arms. It is the use of American military power to achieve our national objectives. Well, as you know, I left out a large middle ground of this continuum and it’s called diplomacy. It’s called engaging with people you don’t like in order to try to find out whether you can narrow differences. And you may not. But you can try. It’s called talking to your adversaries. At a minimum you learn something about them by talking to them and at a maximum you find out that there is some common ground even if you can’t reach agreement. Maybe it’s a question of buying some time, or building alliances or finding support elsewhere that you would not have found without talking to your adversaries. There is a large range of tools that constitute what we call diplomacy. We have had eight years of no diplomacy, and you have two candidates out there who tell us they don’t want to talk to our enemies. Well, I, for one, don’t want to live through another four or eight years of moving from rhetoric to sanctions to war. I want to be able to have a President to come to me, the American people and you, and say, “If we have to go to war, I have exhausted all means at our disposal and I have used all the assets of out national power, including the power of words through our diplomats, through my own diplomatic efforts, and I now feel that we need to go to war.” If the President tells me that, I will get behind that President and I will support that decision. But without that, I am concerned that we will continue to jump from rhetoric to war with the same reckless and careless manner that we have until now. There is one candidate who believes in diplomacy and his name is Barack Obama. And so, the odyssey that I thought I was taking from this 30-years of diplomacy and 30 years of nonpartisanship to a decision to support a candidate who is not, is not as challenging as I thought it would be. It was not a hard decision at all. It was not hard with respect to what he’s saying about domestic issues, which are important to all of us. Whether our children are of school age or not, our education system needs radical repair. All of us need to know that our President is going to be focused on a national energy policy that will reduce our dependence on foreign oil and particularly, those suppliers who can hold it over us and use it as levers to beat us in terms of national security. A President who understands that trade issues do need to be negotiated, but the first constituency of trade has to be our own workers, the people whose jobs may be lost by reckless trade deals. And for us, in the Jewish community, a President on whom we can rely and in whose heart we know there resides a deep and abiding feeling of support for the state of Israel, to do what is best for our country and for our brethren in Israel. And so I come to you tonight in a highly partisan endeavor. Someone said earlier that we aren’t here to convince you to vote for Barack Obama. Well, I am here to convince you to vote for Barack Obama. Q: Why do you think the United States has not done more in terms of Israel’s settlement policy? Is there something people are missing about settlements? Do they protect water aquifers or have some other purpose? A: I like that question. The reason I say that is because it has been a major feature both in my previous life as a diplomat dealing with the settlements issue and it has been a feature now in my life as an academic. There are really two distinct, perhaps even three distinct aspects of this question. The first is those settlements even the state of Israel now declares to be illegal. Israel has had a process since 1967 of approving settlement activity. So Israel has a large number of settlements in the West Bank that are legal in Israeli terms. But since 2001, and a little before that, the settlers began constructing settlement outposts – in other words, the beginning of settlements – that did not go through the formal Israeli government process. There are now over 100 of these settlement outposts scattered around the West Bank. In 2004, the government of Israel unilaterally said to the United States in a letter from one of Prime Minister Sharon’s closest advisors to then-National Security Advisor Condoleezza Rice, that Israel committed to taking down those 100 and change illegal settlement outposts. So when you read in the newspapers today that Israel is still deciding whether to take down those outposts, please understand that this is an unfulfilled commitment that Israel took upon itself unilaterally. It did not result from American pressure or even an American-specific request at the time. Israel has not done that. The second issue, which are the other settlements that Israel did approve through its own legal process. And since 1967, when the first settlements first came into being in the territories Israel occupied after the ’67 war, various administrations have tried different formulations and words and different means and policies to bring Israel to understand our views that the settlements represent an obstacle to peace, an impediment to peace, a barrier to peace – I’m trying to repeat to you the various words administrations have used, including in one case, the illegal settlements in the West Bank and Gaza. What every administration has argued, however, is that settlements are a critical part of the negotiating process, and they must be on the table when Israel sits down with the Palestinians to decide the future of these territories. And so, even today, in an administration that has done so little to advance the Middle East peace process, even today, the administration would agree that settlements are an intimate part of the negotiating process between Israel and the Palestinian Authority, and that the expectation is that most, if not all of those settlements will be removed in the context of an agreement. Now there was a third part of the question, which was: was there something about the settlements that we don’t know? Are they sitting on a gold mine, or on water aquifers? Now, you all know the name Ariel Sharon. We can hope for his recovery, although the prospects, of course, are not terrific. Sharon was considered for many years – decades in fact – the father of settlements. And his argument was that settlements enhanced Israeli security. And in fact he placed settlements that he was able to place, along what he expected to be possible invasion routes, or incursion routes, or transportation routes. In Gaza, he placed settlements to divide the Palestinian population. He thought there would be difficulty on the part of Palestinians to coalesce around a military move against Israel. And a funny thing happened on the way to Prime Minister Sharon’s tenure. The end of 2003, he made a speech in which he said the occupation was not a long-standing possibility for Israel. He used the word occupation, and he called for the complete removal of settlements from Gaza and from the northern West Bank. Now, the Prime Minister didn’t go lax on security. There was still, in his very bones, in his very being, the security of the Jewish people and the state of Israel were all that motivated him. But he understood the dangerous side of settlements in inhibiting the prospect of an agreement between Israel and the Palestinian Authority, in not providing the security that Israel had hoped for, but in fact committing Israel to requiring even more security. This came home in one terrible event in Gaza where an Israeli military outpost was attacked, a young woman soldier was killed, and her parents asked why she was there. And the answer was that she was there protecting the settlements. Settlements, which had been put in place to protect Israel, were now requiring Israeli soldiers in place to protect them. And Prime Minister Sharon of all Israeli leaders understood this, and understood the implications of what he was doing in Gaza and the West Bank as well. So, it’s a complicated issue, but it is in some ways becoming far less complicated, because there is a growing sense and realization in Israel that a two-state solution is the only way to safeguard the security of Israel. That two-state solution should be negotiated with a Palestinian partner who can actually run a state, and that’s our problem at the moment. But that two-state solution will be the best guarantor of security and the best guarantor of Israel’s demographic, and democratic nature as a Jewish democratic state. Q: Senators Clinton and Obama both claim to be strong supporters of Israel. This is an important issue to me. Can you draw any distinctions between their positions on Israel? As President, would Obama call for Jerusalem to be divided? A: Let me deal with the last part first and then come back. On the specific issues to be negotiated, there’s little the candidates have said that would seek to commit the United States. Sen. Obama did talk about Palestinian refugees not returning to the state of Israel. The other candidates haven’t talked about that. Frankly, to be honest with you, my guess if that, if asked, they would probably give the same answer. They haven’t been asked yet, or they haven’t volunteered it. None of the candidates has articulated a specific view about how Jerusalem should be dealt with or issues related to security, and for good reason. These are issues which in the first instance are issues that divide Israel and Palestinians and we should not be intruding sooner than requested by the parties and important for progress in trying to define an outcome. Now, I worded that carefully because the United States has been an intimate and integral part of these negotiations in the past. But you don’t want to jump in too early, and you don’t want to not jump in when the time is right. But this is not the time for candidates, or frankly even the President of the United States, to begin deciding where the line should be in a particular place or in Jerusalem. On the larger question that you asked, which is where the dividing line is between the two Democratic candidates – Sen. Obama and Sen. Clinton – there are two critical dividing lines which stand out with respect only to the Middle East. They also differ on domestic issues, but let me talk about what I know best and that’s the Middle East. I was on a platform in Washington with a representative from the Clinton campaign who said outright, forthrightly, Sen. Clinton will not talk to the enemies of the United States – Syria, Iran and listed a whole bunch of others. This is a difference of viewpoint. Now, when I say, and because I know that Sen. Obama believes that we need to talk to our enemies, it is not out of weakness, it is out of strength. Strength of conviction and strength of national power. And that is a major divide and its one that starts off from a narrow point and becomes a huge gulf because if you start not talking to people, that list will grow forever, because there are a lot of nasty people out there in the world, and there are a lot of people for whom we’d want to establish preconditions for dialogue, but then you’re not going to talk to them, because there are very few people who will change their positions on issues just to enter a dialogue with the United States. So, on this question of negotiations, diplomacy, engaging with people we don’t like, there is a major divide between Sen. Clinton and Sen. Obama. It particularly becomes relevant on the question of Iran. And it particularly becomes relevant because we face, probably in the first term – if not in the first term than the second term – of our next President, some very critical choices with respect to Iran’s attempt to acquire nuclear weapons capacity. Now, our intelligence community and the Israeli intelligence community probably have a sense of how many years it will be until Iran can complete the cycle of uranium and until it can produce independently the capacity to build a nuclear bomb and to weaponize that bomb, to make it deliverable. But, there is an assumption on the part of the rest of us not in the intelligence community that the range is the next three to 10 years. Not less, and probably not more. Which means that we will be calling upon our next President to make a very critical decision that may involve military action against Iran. And there I go back to what I said earlier in my remarks. If we reach that decision in three, four, six – whatever that time period is when the intelligence community brings that assessment to the President and says, “Mr. President, or Madame President, we have reached that corner, we are about to turn that corner,” I as a citizen want to know that we have exhausted a lot of other, may even all the other options for dealing with this problem, before my President decides to pull the trigger and deal with it militarily. And that’s where the question of diplomacy with Iran factors into it. There’s a second issue in the region and in some respects it’s a far more immediate and a far more pressing issue when the President takes office next January – and that’s Iraq. Now, let’s leave Sen. McCain out of it, because he didn’t say he was going to leave troops in Iraq for a number of years. That was a misstatement. What he said was, he wants to leave troops there as long as necessary to achieve the kind of stability that we have achieved by having troops in Korea, Japan and Western Europe for many years. Well, it may be a hundred years, and that kind of prospect really frightens me. So then you have your two Democratic candidates, one of whom is on record as arguing for not the best possible option but the least of the bad options, and that is setting a withdrawal timetable, trying to develop as best a set of circumstances internally in which Iraqi communities can find a way not to live peacefully with each other, but at least in some degree of civility. And to try to share Iraq’s oil wealth far better than it’s being shared now in a manner that is disenfranchising the Sunni establishment even more than they’ve been disenfranchised politically, and this is a Sunni establishment that believes that 1,400 years of control of this country give it some standing. Q: We may not have heard Obama speak clearly about his view about Israel. I’m very concerned. I’ve told Obama I don’t like what I see on the Internet, and you know what happened to John Kerry when he didn’t respond to the swift boaters. I think Obama has been misquoted. What are you going to do about it so that we Americans Jews who hear Obama give us a very clear statement himself about what he’s going to do. A: The Senator has the words out there already. They need to be disseminated. He has spoken to this issue to the Jewish community, to the non-Jewish community. He spoke to this issue in Cleveland and other places, and there has to be a better way of disseminating what he has already said and to continue to reinforce a message that he not only talks about, but he feels, that is part of what it is composition, his person. So we take home this message that it is not enough for me to tell you he has said these things but we have to do a better job of getting the message out. There are ways to get the message out there. Q: I can understand that the Senator, and I can understand that you don’t want to speak for the Senator about exactly what his policies will be between Israel and the Palestinians, but you have recently come out what a book that talks specifically about what needs to be done. So, as a major policy advisor to him, what would you say needs to happen on Day One of his administration to move the process forward? A: There are things that are suggested in this book to be assimilated by the next administration. This [book] was done as a result of a study group that I headed from the United States Institute of Peace, a nonpartisan think tank in Washington created by Congress, which pulled together three of the finest academic practitioners in the United States from the University of Virginia, UCLA and Maryland. We interviewed 100 current and former policy makers and focused on the role of the United States in peacemaking. If you read the book, our advice was decidedly not substantive. What we talked about was how to organize our diplomacy, how to prioritize our diplomacy, how the President should understand the Middle East peace process is not a favor we do for the parties in the Middle East, but it is an American national security interest. It recognizes that other interests may, in fact, be more paramount, but it advises the President not to forget the peace process because if you forget this peace process it comes back to bite you in very challenging ways. We suggested the team the President composes be a team of diverse, experienced professionals; that the President show leadership, although not become the micromanager in negotiating every single detail of such an agreement. In other words, it was a set of guidelines we hoped would impact on the next administration for organizing our diplomacy in the Middle East. I will share this, as I have already, with Sen. Obama. It has also been shared with the other candidates, because it’s a book designed to impact on our policy. It does not reflect Sen. Obama’s views, and I would want to make that very clear. First of all, it was published before I joined the Obama campaign. Second of all, it is my view and that of my co-author, Dr. Scott Lasensky and it is a view that we hope the next administration of President Obama will take seriously. Q: You were ambassador to Israel when Arab leaders offered Israel a comprehensive peace treaty in 2002. They recently reiterated the offer. To the best of my knowledge, it was never discussed by the Israeli government. It was never discussed in the Israeli parliament. It is not being discussed openly in the Israeli media. At the same time, during these six years, Israel has significantly expanded its settlements. How are you going to advise President Obama in encouraging Israel to consider it more seriously? A: The questions relates to what is popularly called the “Arab Peace Initiative,” first decided by the Arab League in 2002, then reiterated in 2007, which changes in very fundamental ways the Arab position toward the state of Israel and toward peace with Israel. Let me talk substance for a moment. I’m not aware that Sen. Obama has addressed specifically the issue of the Arab Initiative. So, let me give you my view, since it was initiated during the time I was in Israel and I actually wrote an op-ed about the Arab Initiative just before the summit meeting of Arab states in Riyadh last spring. The time of its first articulation was very challenging in Israel and the occupied territories. It literally, literally, came out at the end of a month when the greatest number of Israeli casualties was registered – the month of March 2002. There was a suicide bombing every day, or every other day. There was a total preoccupation with security and a total preoccupation on the human side of what was happening. And the Arab League in fact met right at the time, you will recall, of the Park Hotel bombing, which prompted Israel to return its forces to the West Bank. So it was a time when the Israeli cabinet had more than a good excuse for not considering the Arab Initiative. Simply, there was no time on a national agenda when Israelis were being killed by the dozens every couple of days. Fast forward the clock five years: the Arab states for their own reasons decided to reiterate that initiative at the summit meeting in Riyadh last spring, 2007. There was not active intifada in the spring of 2007. In fact, it was a period, which in terms of recent years was somewhat quiescent. And even so, there was very little discussion in Israel of this initiative and almost no discussion in Washington of this initiative, which prompted the op-ed that I wrote for the International Herald Tribune, which suggested that we ought to examine what could be described as a fundamental shift in Arab state attitudes toward the state of Israel. And why did I call it that? Up until the Arab Initiative, the position of Arab states could be described as challenging the 1948 solution. In other words, calling into question the right of the state of Israel to exist. Up until that moment, the Arab states really didn’t distinguish between the territories Israel occupied in 1967 and that part of Eretz Yisrael that was the state of Israel before 1967. It was all, in the Arab mind, subject to negotiation. The Arab Initiative changed the terms of Arab debate and it said if Israel withdrew from the territories it occupied in 1967, and it articulated a maximal position, including from that part of Jerusalem that it has occupied. The Arab states said that they would confer recognition, legitimacy and the security guarantees that the state of Israel would require. Now, no one would expect Israel to jump for joy that it was being asked to give up its maximal holdings in the negotiation, but there should have been some joy in the fact that the 1948 issue for the Arabs had now become the 1967 issue. They were no longer challenging the right of the state of Israel to exist. They were challenging what the borders should be of that state, and whether they should be larger than ’67 or smaller than ’67, but they were no longer challenging Israel’s right to exist. And in that circumstance -- and I only at that time spoke for the United States – it required an American response. And we were asleep at the switch. Israel did engage in a little bit of repartee with the Arabs on this question. The Arabs made one fundamental, tactical mistake in this initiative. The last paragraph of the initiative says, “In order to see this initiative carried through to fruition, we are going to talk to” – and it lists kind of everybody in the world except Israel. It’s a huge, huge mistake and many of us said to the Arab League inspector general and others, “You guys missed the boat.” Because that last paragraph should have said, “We’re going to talk to the state of Israel and the rest of the world,” because it’s addressed to that state of Israel. So it’s not so easy for Israel to simply say, “We love the Arab Initiative,” it’s a problematic challenge. But it does represent a fundamental shift in basic Arab attitudes, which can be part of a diplomatic activity which the United States can held shepherd. We get to the last part of the question: what would I advise President Barack Obama on January 20, 21, 2009, and it is to be agile and responsive to openings and opportunities when they present themselves. And when they don’t present themselves, I would take a chapter from my book: you create opportunities. Because if its important to the United States to help foster peace in the Middle East, why wait for an opportunity to present itself? Why not go out and try to create an opportunity for Arabs and Israelis to talk to each other?